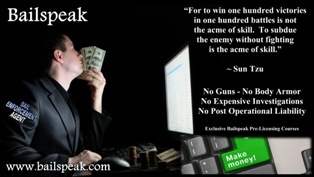 Bailspeak is The Most Transparent Bounty Hunter School in the Nation for Your Protection! 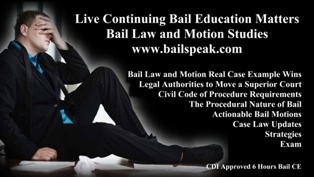 See Dozens of Photographs that are also Video Links throughout this and Bailspeak's many Sister sites regarding this Real Bail Taining School. See the "Class Schedule" page on this site for Bounty Hunter Certification Class Dates, Locations and Enrollment details. You May Register HERE for a CDI Approved 20 Hour Bail Agent Pre-licensing Course good for both your Bail Agent and Bounty Hunting Certification! Bailspeak is the, absolute state-of-the-Art bail agent prelicensing, continuing bail education, and bounty hunter school that has been and is now operating in the Country Today. Hundreds of people have taken classes and bounty hunter street training in Sacramento, Modesto, San Jose, Fresno, Burbank, Los Angeles, Thousand Oaks, Riverside, Norco Corona, San Diego and via privately ordered classes throughout California. Bailspeak also offers advanced bail bond motion continuing bail education, Taser User Certification that is also approved for six hours of continuing bail education, liability-free bounty hunting since 1992, and Bailspeak’s cadre of instructors are also agents for multiple sureties and with a proven track record of bail bond motion drafting and winning bail bond motions via open court appearances in the California Superior Courts. You will not find another fugitive recovery school specializing in advanced bail enforcement like Bailspeak, but you will find that Everything about Bailspeak is Copied by others! Click on the Above Photo to see Security Officer Advanced Bounty Hunting Video. UNDER WHICH LAWS DO BOUNTY HUNTER CARRY FIREARMS? Click on the above photo to see a video that contains information as to which areas of various laws you must have a working knowledge of, along with the consequences of ignorance, before performing the calculus and then confirming that all the critical elements are in fact present and current and all of which has to be confirmed before carrying a gun as a bounty hunter. Bailspeak is the only bail bonds and bounty hunter training school that presents all the variables described in the video and then explains how it all fits together. Bailspeak is the Fastest Growing and Most Trusted Name in California Bail Education, according to its hundreds of Alumni who have participated in the following DOI Approved bail classes for bondsmen and bounty hunters. 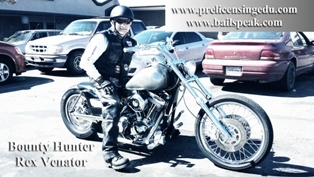 Please see the “Expert Bail Instructor” page on this bail education website for more background information about Bailspeak’s Founder, Primary Instructor, and who is profiled in the above video—Rex Venator. The very harsh and very real fact is that it would be a serious miscalculation to take on the mindset that you yourself will never, ever, have to take on the role of a bounty hunter when it may very well be your own assets and money on the line and with no bounty hunters available when an emergency strikes. In the above video, there are quotes from real bail agents and Taser Cam Video from an actual bail jumper apprehension; moreover, there are clips from Bailspeak's on-point, real-world training classes. The time to know bounty hunting is before your clients jump bail; the time to know how to hire a bounty hunter is before your clients jump bail; indeed, the time to learn isn't after your client jumps bail. Lastly, bounty hunting is a part of the California state bail agent exam, and you may very well fail the test if you do not know how to lawfully bounty hunt in California. Click on the Above Photo to see Penal Code Section 1299 Certification Class Video. 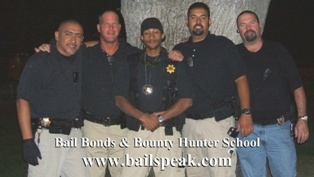 Every new bounty hunter should effort to improve his or her position in the bail bonds industry with an emphasis on improving one’s earning potential and while learning how to run a small bail bonds related business. 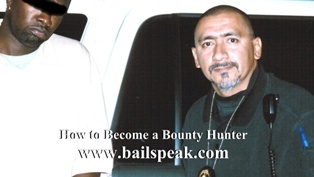 Bounty hunting is a great way to learn bail bonds from the inside out, and, during these tough economic times, it stands to reason that one should endeavor to learn how to bring in the most cash in the shortest amount of time and with minimal investment. This school is run by successful business owners who continue to help those who are daring and willing to look ahead and dream of bigger things. Research the laws of the state where you intend to bounty hunt in, if it is legal in your state at all, and seek out training and education in that precise state! There is no known program that can train you in all of the states where there is commercial bail. Bounty Hunting is a Trade, like that of a carpenter, electrician, plumber, or machinist to the extent that one should strive to become an apprentice under a veteran bounty hunter who bounty hunts legally. Please Feel Free to Hover your cursor over any of the below photographs to view more bounty hunting videos going back nearly 10 years. 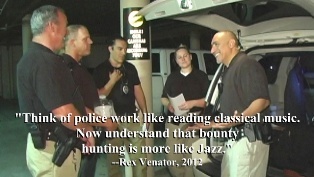 Fugitive Recovery Training in California from Rex Venator on Vimeo. 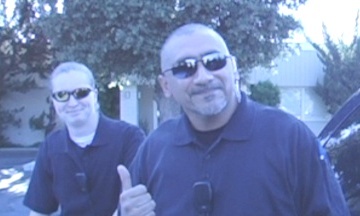 fugitive recovery training california from Rex Venator on Vimeo. 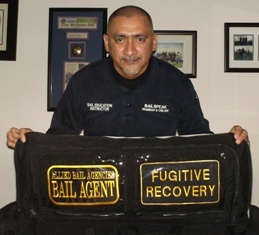 Fugitive Recovery Training in California is comprised of bail education in numerous parts of the many codes that makes up California laws to include the California Constitution, published case cites, and it is equally critical to have a working knowledge of how federal law may or may not apply to bounty hunting activities and in direct relation to operating as a bail enforcement agent. Bailspeak is a California Department of Insurance Approved Bail Education Provider with nearly 4,000 Alumni and with many who are now working in the fugitive recovery, bail bonds, or bail bonds ministerial areas of the California Bail Bonds Industry. In point of incontrovertible fact, today, more than ever, top bail bond recruiters actively seek out Bailspeak Alumni to fill positions in top ranked bail bond companies and corporations. 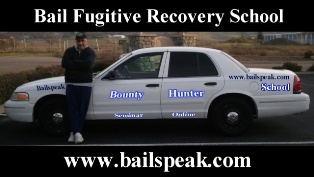 Moreover, bounty hunters and bounty hunting team leaders have openly expressed a preference towards Bailspeak Alumni for slots on their fugitive recovery teams or in-house bail enforcement divisions for the larger bail corporations. Thank you for taking a moment to watch the video and read this accompanying video description. A bounty hunter should consider not relying on training that instills rehearsed responses to predictive outcomes and, instead, focus on training that is designed to respond to changes in conditions with an emphasis on being so simple and without structure that such training is designed to mold and adjust to the matter at hand; these shapeless principles create the difficult task that today’s instructors must master as a sacrosanct teaching responsibility to students who intend to go into felony hazard situations—in my personal and professional opinion as a fugitive recovery training instructor. Rex has himself demonstrated to numerous bail bonds companies, surety corporations, and his bounty hunting trainees how he has caused 100% of the bail bond forfeitures he's undertaken to be set aside in open court since 2000. Rex conceptualized and put into action his "Triple Attack" theory, explained in his book "Desktop Bounty Hunter," whereby, as an agent for multiple sureties, he has simultaneously tracked bail fugitives and while negotiating bail bond motions that were designed to create new causes of actions that ultimately led to bizarre exonerations. 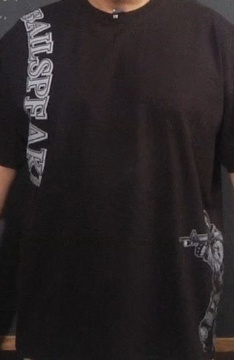 In point of fact, Rex's Brand of bounty hunting has been highly sought after in terms of learning the mechanical workings of his bail enforcement operations, the theories to his bail bond motions, and all of which are drawing larger and larger numbers to California Department of Insurance Approved Bail Education classes that he himself created from Street Proven methodologies. A Working Knowledge of the Bail Motion Process is Critical! A major part of running a bail bond company is, quite frankly, your active willingness and effort to have a working knowledge of how to draft, appear and then stand up in a California Superior Court, fully prepared, to make an oral argument, counter written and oral opposition from government lawyers, and then convince a court that granting your moving papers is the correct action that will also keep your company solvent. 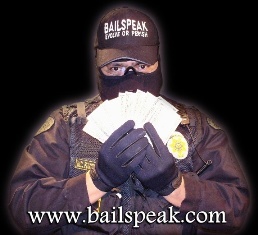 Bailspeak CDI Approved Bail Law and Motion Bail Agent Pre Licensing and Continuing Educational Samples of real motions, petitions (that actually worked in court as argued by Rex) to exonerate forfeited bonds and much more information critical to Advanced Bounty Hunting by Fugitive Recovery Agents, Bounty Hunting Bail Agency Owners, and in house Bail Enforcement Agents. 20 hours of insurance pre-licensing is required to obtain a license to transact bail as a bail agent in California, and this same exact course is also a critical requirement to legally act a bail fugitive recovery agent for a bail bond company and to do all of which within the scope and meaning of many complex and sometimes conflicting laws. The responsibility of providing the best possible bail education training is taken very seriously, and every effort to produce the most informed bail agents and bounty hunters in the California Bail Bond Industry is considered an honor to the extent that every Bailspeak Certificate awarded is undeniably earned. Bailspeak’s bail agent pre licensing course is, arguably, the Number 1 Choice of professionals in the California Bail Bonds Industry tasked with recruiting new hires to fill bail jobs in such areas as posting bail bonds, bounty hunting, and numerous ministerial positions common to bail. 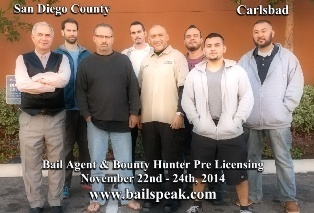 Bailspeak is a California Department of Insurance Approved Bail School now in its seventh year of operation. Can Bounty Hunters Shoot Bean Bag Rounds (actually metal shot) at Bail Jumper's faces, eyes, and at internal organs and from any distance? Scroll Down to Read Rex Venator's preliminary opinion editorial on the above questions. BEAN BAG ROUNDS FOR BOUNTY HUNTING? Bean Bag Stun Guns conjure up horror stories from bean bag shotgun rounds that have a ghastly track record of negative press irrespective of the conditions at the time law enforcement engaged a suspect with what is commonly called “less than lethal” use of force options. In the film “The Hunter” starring Steve McQueen who plays legendary bounty hunter Ralph “Papa” Thorson, McQueen is seen utilizing a “Prowler Fouler” bean bag stun gun intended to “incapacitate” a bail jumper long enough to handcuff the bail jumper. A government report details a series of protracted tests conducted on the Prowler Fouler and its pros and cons with swine and baboon test subjects and resulted in kinetic and pounds per square inch findings near identical to modern-day equivalents that resulted in an expansive range of post impact results ranging from annoyed test subjects to instantly killed subjects and with moderately to severely injured test subjects in-between. The tests show that the variables of charges used, temperature, distance between the Prowler Fouler and the test subjects and actual impact sites directly, and, more importantly, indirectly had insidious effects inside the animal test subjects. Researchers coined the expression the “Liver Phenomenon” indicating that internal organ damage, specifically the liver of test subjects, were mildly to severely damaged and in such a way and manner as to be seemingly and wholly unrelated to the strength of the load used and the actual impact sites that oftentimes showed no signs of trauma to the skin. Injuries to test subjects ranged from recoverable organ damage to concussions and to lead shot impact fractured bones that pierced vital organs resulting in inevitable and even instant death. Here we arrive at what may be the more accurate set of questions: should bounty hunters use any type of bean bag round; should bean bag rounds be used with no training; what are the legal authorities for deploying a bean bag round; what is the liability associated with the improper employment of a bean bag stun gun such as the fabled Prowler Fouler? Quantum of Force tests, minimum safe distances, and “red zones” are hyper-critical to test and establish by and through protracted study, unbiased findings, and all of which to be done before exposing bounty hunters to the technological and reasonable person test parameters that are all consistent with current court holdings or dictum insofar that the legal authorities for deploying a bean bag “payload” within the current scope and meaning of the justifiable use of force is unconditionally compulsory to protect fugitive recovery agents, bail agency contractors, and property and casualty sureties from wholly unnecessary incidents that could be easily avoided or remedied by and through proper use of force continuum training by a California Department of Insurance bail training school such as Bailspeak. The aforementioned opinions are those of the author and only expresses personal opinions separate and apart from Bailspeak, its subsidiaries, airs, and sister companies and corporations and is only for educational purposes consistent with First Amendment Expression. Rex Venator is a Published Author and Investigative Reporter for the Adventure Trades Online Message Board and Forum. I am looking forward to learning how the pictured Bailspeak Alumni from this past weekend’s Carlsbad San Diego County Bail Agent Pre Licensing Class will apply the impact of the course content going forward in the California Bail Bond Industry to include how the most current changes to bail laws and California Appellate Court Decisions are received and shared with colleagues by this group of gifted men now embarking in both fugitive recovery and bail bonds. ARE YOU A BAIL ENFORCEMENT AGENT SEARCHING FOR STREET PROVEN BOUNTY HUNTING EQUIPMENT SUPPLY GEAR FOR THE FUGITIVE RECOVERY OF BAIL JUMPERS? See Bailspeak's Primary Instructor, Rex Venator, briefly go over some of the new and highly specialized bail enforcement store products that are available for pre-class order and class will call pick-up when ordered 10 to 30 business days in advance, depending on the product: Taser, Body Armor, Kevlar Helmets and etceteras. The following video includes subject matter that is only intended to be considered as a Quick Startup Guide on what you should question and research when deciding if wearing body armor is right for you. DO NOT wear body armor containing or made with Zylon!!! Wearing body armor has been reported to increase the survival chances of those involved in serious vehicular accidents and collisions with wild animals. The decision to engage any in activity that may necessitate the need for one to wear body armor should be taken very seriously because we are talking about wearing something that is supposed to stop bullets from entering the parts of your body covered by the body armor. · Body armor should not be considered bullet proof; body armor should be considered bullet resistant, and special body armor is needed for stab protection from threats such as sharp knives or ice picks. · Never, ever, purchase second-hand, used body armor. · Never, ever, purchase body armor from anonymous Internet sources, non specialized online stores, or other decidedly creepy places. · Never barrow your buddy’s body armor who can’t tell you where his loaners vest came from. 1. There are all kinds of methodologies to bounty hunting, and not all investigations are handled the same way due to the fact that no two bail jumper cases are identical. 2. Going through a door after a wanted felony fugitive looking at 25 to life is not a good idea, but sometimes we go through doors and stumble upon such persons. 3. Low profile investigations aren’t really low profile if one looks like a SWAT operator. 4. Concealable body armor is my person choice. 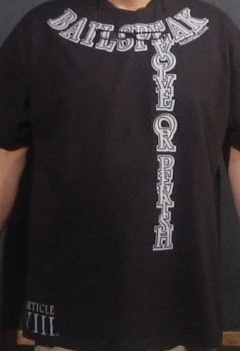 I can wear it in low profile mode and under a tactical vest if the investigation calls for it. 5. Lastly, if a bad guy decides to take you out, will he target your tactical vest or your face? These are some considerations for your choices on body armor. Body armor comes in all kinds of different levels and configurations, but we’re going to stick strictly to bail enforcement or fugitive recovery. · Make sure you yourself can legally possess body armor. · Employ no less than Level IIIA Kevlar panels in your vest, which offers a bit more blunt force protection and is also rated to defeat more of the uncommon rounds such as .44 Magnum hollow points and 9mm sub-machine gun rounds BUT not rifle rounds. · Make sure you can move around in your vest choice. It shouldn’t be too restrictive if possible. · Confirm your choice meets the National Institute of Justice ballistic standard of no more (01.01.04) than 1.7” or 44 mm of blunt force indentation trauma, which can kill if a dent caused by a bullet impact is too deep even if the bullet does not pass through the ballistic panel in question. · Your vest should be a full wrap around; don’t leave your sides exposed. · Get professionally fitted in-person by a manufacturer’s authorized dealer if possible, or take the extra time to contact a reputable source such as the www.realbountyhunting.com bail enforcement equipment supply store. · Six to eight weeks later...you’ll get your body armor. Manufacturers of body armor products generally recommend changing out your body armor every five years, as Kevlar is believed to degrade and be less likely to defeat bullets with prolonged exposure to body sweat, extremes in cold and heat, and from just general wear. · Your vest can’t stop bullets if you don’t wear it. · Store your vest flat at room temperature when you’re not wearing it. · Do not leave your vest in a vehicle full-time. · Keep track of how old your vest is; is it time to replace it? · Don’t loan out your used vests to your buddies or anyone else if it is older than 5 years old, been sitting in a trunk for weeks, months or years, or if you picked it up at a gun show, Ebay, or anywhere else but in-person such as a police supply store. It is my sincere hope that this short Bailspeak Bail Training School video has given you some direction on your research for how to purchase body armor. 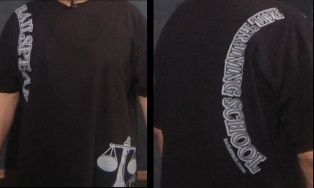 Get professionally sized and order your bounty hunter body armor at any Live Bailspeak 20 Hour Bail Agent Pre Licensing Event, which are routinely held in Roseville, Sacramento, Modesto, San Jose, Bakersfield, Los Angeles County, Riverside County, and San Diego County—Coming Very Soon to a bail school class near you. Please Note: a background check is required for body armor purchases. "So live your life that the fear of death can never enter your heart. Love your life, perfect your life; beautify all things in your life. Seek to make your life long and its purpose in the service of your people. Always give a word or a sign of salute when meeting or passing a friend, even a stranger, when in a lonely place. When it comes your time to die, be not like those whose hearts are filled with the fear of death, so that when their time comes they weep and pray for a little more time to live their lives over again in a different way; sing your death song and die like a hero going home." ~ Tecumseh (/tɛˈkʌmsə/; March 1768 – October 5, 1813) was a Native American leader of the Shawnee and a large tribal confederacy (known asTecumseh's Confederacy) which opposed the United States during Tecumseh's War and became an ally of Britain in the War of 1812.